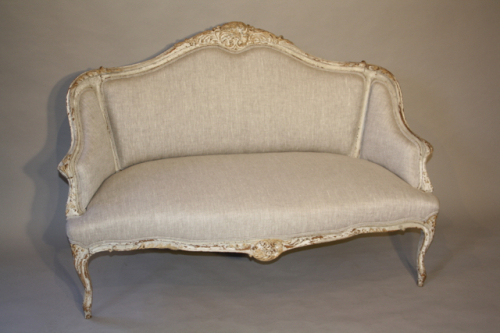 A lovely petite, elegant curved two seater C19th French sofa with original paint and lovely carved wood details. Reupholstered in pale grey/cream linen front and back. Seat height is 41cm. Great curves all round. Would work perfectly at the end of a bed, in a bay window as well as in a sitting room.